Campaigners will stage a theatrical protest against BP’s sponsorship of the Edinburgh International Festival on Sunday. They argue cultural institutions across the UK are offering a veil of legitimacy to the firm as it continues to drive climate change and cause environmental destruction. Environmentalists, academics and artists will gather in the heart of Edinburgh to highlight BP’s monopolization of Britain’s cultural landscape. In particular, they are criticizing the Edinburgh International Festival's acceptance of funding from the oil giant. 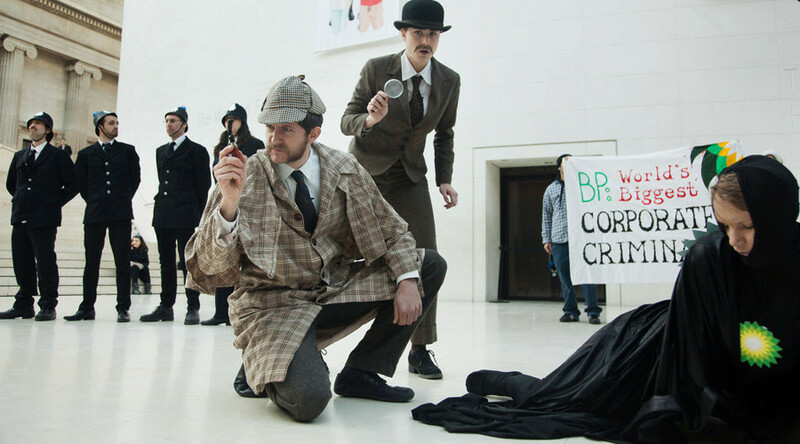 The demonstration has been organized by activist theatre group ‘BP or not BP?’ which has campaigned extensively against BP's practices across the globe. The performance group will gather in Scotland’s capital on Sunday, where it will stage a street theater performance to highlight what it says is the festival's "unethical" choice of sponsor. The protest's organizers say that BP’s funding of the event is an attempt to distract attention from its role in exacerbating climate change. Performers will be joined by Friends of the Earth Scotland, staff and students from the University of Edinburgh, and artists scheduled to take part in the festival. Protesters attending the demonstration have been instructed to dress in black, and arrive at a yet-to-be disclosed venue in Edinburgh at noon. BP has been besieged by scandal in recent years, and is facing the prospect of steep regulatory fines after a judge ruled on Thursday some of its energy traders rigged the US' natural gas market in 2008. The oil giant's Southeast Gulf Texas desk stands accused of conspiring to lose money on physical gas positions to boost the value of an investment portfolio of financial derivatives tracking gas. The ruling, which could land BP with fines totaling tens of millions of dollars, is the latest of a series of US regulatory crackdowns on the energy firm. In July, the oil giant was hit by a mammoth $18.7 billion fine over its role in the catastrophic 2010 Deepwater Horizon oil spill in the Gulf of Mexico. It has also been linked to human rights violations in Columbia, Azerbaijan and elsewhere. BP has sponsored the Edinburgh International Festival for 34 years. The energy firm’s corporate grip on Britain’s art world also extends to the British Museum and Tate. Among the energy extraction techniques BP has been criticized for are fracking and deepwater Arctic drilling. BP or not BP? warn the energy firm continues to draw unsustainable levels of fossil fuels from the earth, while using its influence to lobby against progressive forms of climate action. Jess Worth of the “BP or not BP?” group decried the Edinburgh International Festival's acceptance of funding from BP. “BP has a business plan for the end of the world, and the Edinburgh International Festival is endorsing it through this sponsorship deal,” she said. Ric Lander, a campaigner at Friends of the Earth Scotland, told RT BP’s ethical and environmental legacy is scandalous. “BP has been involved in some of the world’s biggest environmental disasters and actively lobbies against meaningful action against climate change,” he said. Edinburgh People & Planet campaigner and medical student Eleanor Dow said the oil giant's role in greenwashing must be exposed. “We need to expose this absurd and dangerous act of greenwashing by a company that is contributing to catastrophic climate change,” she said.